A joint session of Congress counted the Electoral College votes and certified them on Friday, formally bringing this unconventional presidential election to a close. Several House Democrats tried to raise objections multiple times during the vote-counting, but they didn’t acquire signatures from a senator for each of the objections. 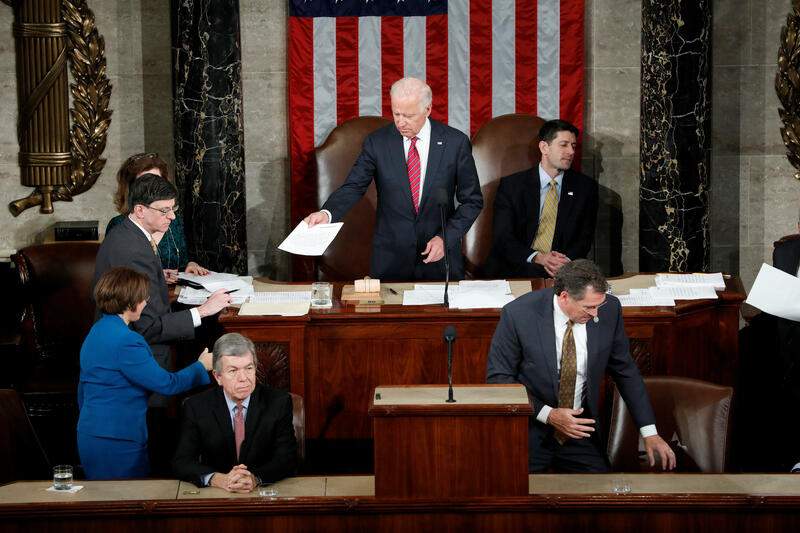 “It’s over,” Vice President Joe Biden told Democrats as their effort repeatedly failed. Speaker Paul Ryan, R-Wisconsin, was seen laughing behind Biden as he made that remark. The Democrats who raised objections included Reps. Jim McGovern, D-Massachusetts, Barbara Lee, D-California, Sheila Jackson Lee, D-Texas and freshmen Reps. Pramila Jayapal, D-Washington and Jamie Raskin, D-Maryland. Some argued that the electors were not lawfully certified in some states while others complained about voter suppression and Russian interference in the election. At least two demonstrators in the House gallery began protesting during the vote-counting and were removed from the gallery area above the House floor. Lee of Texas led the effort to object to Trump’s election. She and other House Democrats wanted to draw more attention to American intelligence findings that Russia worked to sway the election in Trump’s favor. Under federal law, if at least one senator and one House member object to the vote from any state, the House and Senate would meet separately to debate the merits of the objection. Regardless, with Republicans controlling both chambers, any objection had little chance of affecting the outcome. “Hillary and the Dems were never going to beat the PASSION of my voters. They saw what was happening in the last two weeks before the (election) and knew they were in big trouble - which is why they cancelled their big fireworks at the last minute. THEY SAW A MOVEMENT LIKE NEVER BEFORE,” Trump wrote. Despite rumblings of a revolt, only two Republican electors - both from Texas - cast protest votes for someone other than Trump. Clinton lost four Democratic electors in Washington state and one in Hawaii.